From Kraftwerk’s travel obsession and the endless poetics of Manuel Göttsching’s E2-E4 to Atom™’s overt Schubert references on Winterreise, German Romanticism has been an enduring presence in electronic music. So too for Berlin clicks and cuts/dubtechnoist Stefan Betke and minimal techno godfather Wolfgang Voigt. Over the past fifteen years, both artists have forged a connection to the sublime in nature and the seduction of the German forests—associations made explicit in lyrical German album titles and cover art. Here, Voigt and Betke discuss the reciprocal reflection of the digital and natural and the pitfalls of merging artistic and national identity. Wolfgang Voigt: People often ask me about my relationship towards nature and forests, and because I’m tired of answering these questions, I thought I’d take the chance to ask you about it Stefan: You’ve released two albums with explicit nature references in the titles—Waldgeschichten [“Stories from the Forest”] or Steingarten [“Stone garden”]. What’s your connection to nature? Stefan Betke: [laughing] Well, Steingarten is an interesting example. The photography on the cover is of Neuschwanstein Castle in Bavaria, located in one of the most beautiful regions of the German Alps. Honestly, I would say my love of nature is straightforward: nature is where I can breathe and relax best, and the further I get from the city, the more my thoughts decelerate . . . even though I still love big cities too. It’s the same today as when I was a child. I love the mountains; I love hiking; I love the forests; and I love resting on a tree trunk and observing my surroundings, and I have no problem spending hours in the car or in a train to reach my destination. But to be honest, that’s not the only reason why I name my albums the way I do. It’s no coincidence that I use my mother tongue when it comes to album titles. By calling an album Waldgeschichten instead of Stories from the Forest, I define and locate myself and my roots with greater precision. I’m Stefan Betke, a musician from Germany. That’s what and who I am. Bizarrely, some people actually tried to interpret nationalistic tendencies into my music because of that, which is nonsense. I mean, would you suspect an Italian writer to be nationalistic just because he or she writes in Italian? WV: I’ve been confronted over and over again with accusations like that throughout my whole career. I just tune it out. SB: It still makes me angry. People don’t seem to understand that trying to define your identity is partially linked to the language you speak; the language you dream and think in. An incredibly important aspect of making music is about defining an artistic space. WV: When I released my GAS trilogy some fifteen years ago, I wasn’t making a political statement. There were two reasons for the name GAS: First, the beginning- and endlessness; the amorphous structure of the music seems to emanate like gas. And second, the association of a dense fog in a dark forest. Of course, I was also experimenting with the romantic cliches and myths of the German forest. Although, in my opinion, the music stands for itself. To me this still seems to be a natural and consistent approach towards music, wherever you’re from. Making music about forests and childhood memories had a lot to do with connecting myself to a world of my own associations and ur-aesthetic experiences—some of the most formative ones. SB: Physical places can be extremely inspiring. I’m sure you know that dub music has also been an incredibly important influence for me. It might sound strange, but I often view the vastness and architecture of the forest as a grid with smaller units defined by particular trees—which is also how I envision the spatiality of dub. WV: And what do you get from meditating on the forest as a grid, of being in the middle of it? SB: It’s hard to describe, but when I look into the sky it sometimes explodes . . . All I know is that the forest for me is a space of vital importance—not to mention for the survival of our planet. WV: I’ve meditated quite a bit on the forest in the past, but at the moment, I feel a similar attraction towards the Internet. In a sense, it’s like a huge forest too. The Internet also offers its own forms of ecstatic experience and infinity . . . not to mention the pure density of information. I’m currently working on an unofficial follow-up to GAS titled Rückverzauberung [“Re-enchantment”]. Here, my approach to making ambient music has become increasingly abstract—more amorphous and unbridled, rhythmically speaking. I’m trying to infiltrate various kinds of musical and visual material—audio samples, photo scans—imbuing them with a new kind of magic. It’s actually not so different from what I attempted to do with forest themes, but more free and radical than ever before. SB: I feel like I’m doing something very similar in terms of reinterpreting a given musical space. It’s important to stress the fact that dub “space”—like any musical or artistic genre—should not be understood as confined to specific elements. The same goes for physical space. I mean, Berlin after the fall of the Wall had empty spaces and places that were extremely important for inspiring new perspectives, new visions, new art. Physical space gets recast, or re-enchanted, as you say. Using dub methods to create space—like I do in my music—is inspired by looking at details in an unfinished city as well as watching a green valley. The beautiful thing about having nature as a point of reference is that art is endless like nature is endless. Like Sun Ra said: space is the place. And since we’re again on the topic of nature: What was the idea behind naming your new project with Jörg Burger “Mohn” [“Poppy”]? WV: First, I agree that dub “space” is unlimited. Also, if you see dub as a science of echo and reverb, then it makes sense to see the mountains as the original dub “space”. In regards to Mohn, let me remind you that I like being seen as a man of the now, and of contradiction and conflict. I love seeing something abstract or digital in nature, and vice versa. I associate “Mohn” with all things slow and narcotic. Of course, I wouldn’t object to the association with opium dens. At the same time, Mohn is about music that’s extremely mathematic and complex. I see a different aesthetic level emerging when I combine the narcotic and the mathematic—one that’s characterized by my new interest in non-nature related fields, especially the digits “1” and “0” that define our digital world. For me using pure Ableton or Photoshop plug-ins can lead to really interesting results without combining them with anything analog. I think it all depends how you use them. It’s not important if I work with analog or digital material. I always oscillate between strictly mathematical structures and wild unquantized improvisation—playing my sampler with my tongue like Jimi Hendrix his guitar. SB: That’s what the whole digital evolution is about: adding new instruments and creating new artistic possibilities. I think you can “play” the computer like Hendrix played guitar. Of course, how you work artistically is connected to your specific background. Aside from influence of jazz and the avant-garde, I see myself in the Rhineland tradition of Stockhausen and Can, and I’ve learned a lot from West German musical history. But it’s still only a foundation. Certainly, things would have taken a really different direction if I had never seen Conny Plank’s studio or early DAF performances in Dusseldorf. I imagine I probably wouldn’t have become a musician. Of course, I’m not interested in imitating anybody, but whenever I’m intrigued by something, I try to research and learn as much as possible about it. Music especially. WV: I’m the same. Everybody has their own musical influences and I wouldn’t be the person I am without having been obsessed by other people’s music over the years. But at the same time, I’m convinced that techno would have existed without Kraftwerk, Can or Stockhausen, even though some of techno’s older protagonists—myself included—have built up their vision of music through knowledge of their music. But I’d doubt that my personal development would have been very different growing up in a smaller German city. Admittedly, my uncle was the janitor of the Cologne Music Conservatory during the sixties and seventies, and he would always let me in when jazz or classical concerts were scheduled—Manfred Schoof, György Ligeti, Mauricio Kagel, Bach, Stockhausen . . . But I wouldn’t call these experiences truly “formative”. Life is what you make out of it, for the most part. It’s the active part, not the passive that defines you. SB: I would say that, excluding dub, I’ve been influenced by three main schools of electronic music: Rhineland, Berlin and Detroit. All three were important because they stood for larger ideas. So, when I started making music I always had a bigger picture in mind, even though I try to keep my references relatively inconspicuous. It was more an attitude that I inherited from my freethinking predecessors. More than anything else, they taught me to believe in myself. WV: I respect my teachers, but I’ve become a grown-up in the meantime. And that kind of artistic maturity means that I’m responsible for what I’m doing—and no one else. At the same time I feel committed to the vanguard, to the future. It’s interesting to note that today, since record sales have dramatically declined, it doesn’t even make sense anymore trying to go with trends. Try it out—it doesn’t work. For a couple of years now, I’ve been attempting to free myself more and more from the business side of things simply because artistic truthfulness is so much more important than sales expectations. And to be perfectly honest, it’s been liberating. Envisioning the future is one of the most beautiful things you can do as a musician. I mean, I’m fully aware that I probably can’t invent entirely new sounds or approaches like Stockhausen, because somehow all sounds have been invented already. But I’m sure I can still invent new music by finding new combinations of sounds, or reinventing and re-enchanting them. SB: I think the biggest temptation always lies in the music that you’ve already made. There’s something strangely seductive about repeating yourself in order to stay true to your own legacy. But you have to keep that in check—to refine what you’ve done in the past without copying it by adding new motifs and getting rid of other pieces. I describe it as a basic vocabulary that I have from my musical socialization and the paths I’ve taken in life. My goal is to add to that vocabulary and find new ways of synchronizing it with enhanced style and method. But the goal always remains the same: to create something new, despite the limitations of what’s already been done. You can’t see that as a burden—you should see it as a chance. Photo: Andreas Stappert. 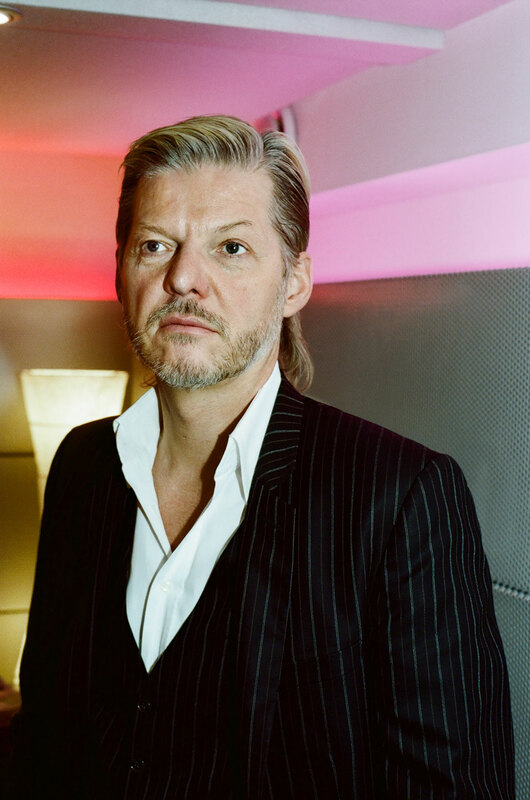 Wolfgang Voigt in Kompakt HQ Cologne.